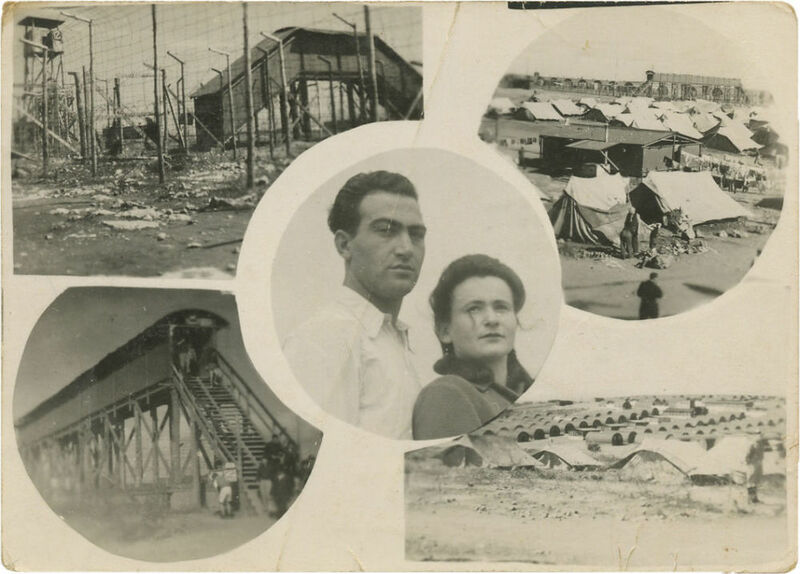 Marriage ketubah from a detention camp in Cyprus, and a card with a photomontage of the married couple and photos of the camp. Cyprus, ca. 1948. 1. Ketubah recording the marriage of Moshe Ben Ya'akov and Esther Bat Yitzhak, from 15 February 1948. "On this date in the camp of Jewish detainees near the city of Dekhelia on the island of Cyprus". Near the city of Dekhelia north of Larnaca were seven internment camps known as "Winter Camps". Due to the poor conditions, the ketubah was typewritten and mimeographed, on thin paper of poor quality. On the leaf's verso is an ink stamp of the "Chief Rabbinate, Cyprus", hand-signed by the secretary. Approx. 30.5X23 cm. Good-fair condition. Stains, folding marks and some holes (small, with no damage to text). Restored tears along folding marks and at the margins. 2. Souvenir card with a photomontage: photo of a young couple (presumably the couple whose names appear on the ketubah), surrounded by four photos of the camp. 6.5X9 cm. Good-fair condition. Creases and blemishes. Stains on verso.